Marine Lcpl. 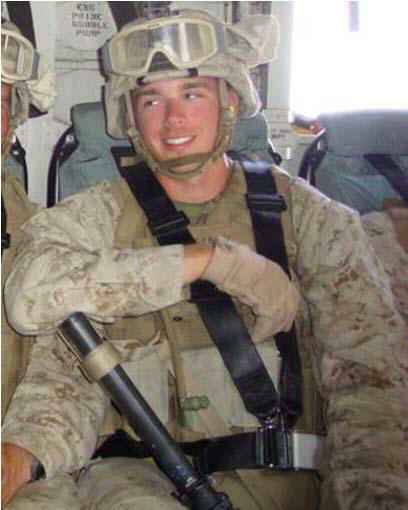 Michael E. Geary - Run for the Fallen New Hampshire, Inc.
20 of Derry, NH; killed in action while conducting combat operations in Helmand province, Afghanistan. Raised by his mother and grandmother, Michael developed a strong sense of compassion and a protective instinct. Louise helped to raise Michael, while Nancy worked full time to support them. At the age of nine, the three of them moved to Derry, NH, where Michael eventually attended high school at Pinkerton Academy. Michael became active in a variety of sports, attaining his black belt in karate and later participating in mixed martial arts competitions. At Pinkerton, Michael also played for the football team. For hobbies, he enjoyed target shooting, running, airsoft and paintball games, as well as playing football with friends. Deeply impacted by the 9/11/01 attack on America, Michael felt the burden to serve his country and to protect others. The Marines provided that opportunity. 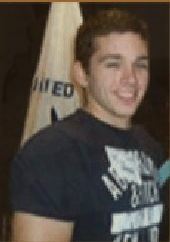 Michael began his Marine training while still at Pinkerton Academy. What others never saw about Michael was that he worked out every day, before and after school, in good and bad weather, even when he wasn’t feeling well. It’s what Michael did behind closed doors that made all the difference in his life. Michael was assigned as a rifleman to the 2nd Battalion, 9th Marine Regiment, 2nd Marine Division, II Marine Expeditionary Force out of Camp Lejeune, North Carolina. 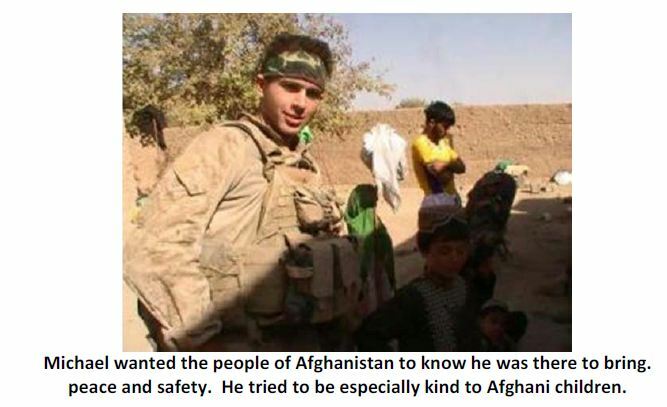 He began serving his first tour of duty in Afghanistan in July, 2010, and was due to return home in February, 2011. Michael made the ultimate sacrifice during a combat operation in northern Marjah, on December 8, 2010. To all who knew him, Michael was fun‐loving, always able to bring a smile to the faces of those around him, no matter what the circumstances. The Marines who served with Michael always talked about how his attitude and sense of humor helped them to get through the tough days. 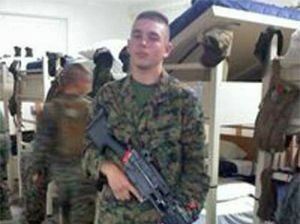 But when it mattered, they also said he was an exemplary Marine, who excelled under fire. Michael never wanted others to worry. 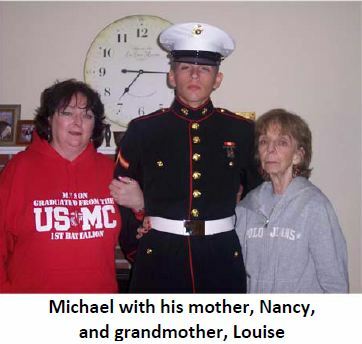 Whenever he called home, whether from a grueling training exercise or overseas in action, Michael would always greet his mother with “Hey Mom! I’m doing fine.” and speak with an upbeat tone as if he were in the next room planning a night out. Perhaps no story better exemplifies Michael than at Christmas in 2009. Michael had given his own Christmas leave away to another Marine who had a family. At the last moment, Michael was also given leave for the holiday. 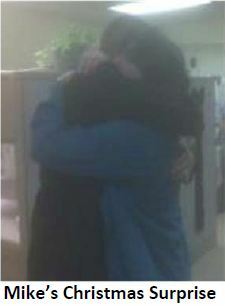 He traveled all night so that he could surprise his mother at her place of work. The ensuing scene, where Michael popped out of an adjacent office as his mother returned from her break is one that will never be forgotten by any who were there to see the tearful reunion…and of course, the beaming smile on Michael’s face. Throughout his life, Michael was surrounded by a tightly knit group of aunts, uncles, and cousins, in addition to his mother and grandmother. 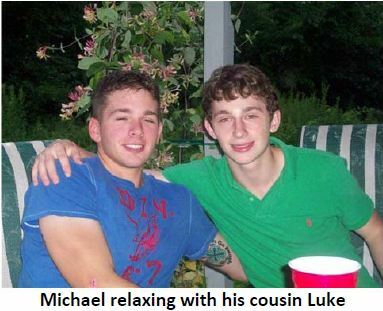 Michael became particularly close to his cousin, Luke Douglas, for whom he became both older brother and mentor. A quiet freshman, Luke was frequently awakened early on weekend mornings by Michael dragging him from bed to take him on one adventure after another. Michael gave Luke confidence and motivation to become a straight‐A student. The college scholarship Luke eventually earned would have made Michael beam with pride. Michael’s family, while heartbroken at the loss of our one so encouraging and kind to others, is at the same time proud of the man that Michael became and thankful for the well wishes and support of the community who have helped to honor Michael’s memory. Michael’s empathy and love for others are the underpinnings of the life choices he made, choices which eventually led to the loss of his own life for the sake of others. Michael’s loss forever leaves a hole in the hearts of those of us who had the blessing of knowing him the few short years he lived on this earth. 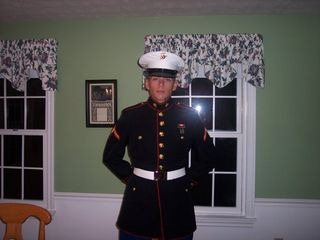 Michael was promoted to lance corporal in March 2010 and deployed in July 2010 in support of Operation Enduring Freedom. His awards include the National Defense Service Medal, Afghanistan Campaign Medal and Global War on Terrorism Service Medal. He was buried with full military honors at the New Hampshire State Veterans Cemetery in Boscawen, NH. He is survived by his mother, Nancy M. (Buiting) Geary; his father, Timothy Geary; his paternal grandmother, Beverly Geary; his uncle William Geary; , predeceased by his paternal grandfather, Charles Geary and by his maternal grandparents, Joseph and Louise Buiting.